Michael Morgan giving a lecture and master class to students at the Conservatory of Vocal and Instrumental Arts, a music charter school in Oakland, California. (J. Mar/VOA). 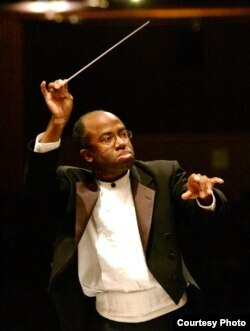 As one of the few openly gay, African-American conductors in the United States Michael Morgan is a rarity in the world of classical music. He has been music director of the Oakland East Bay Symphony in California for 22 years and has worked with some of the great conductors of the 20th century, including Leonard Bernstein, Gunther Schuller and George Solti. However, it is Morgan's mission is to bring classical music to everyone, especially to diverse audiences who have traditionally been under-represented in the concert hall. Morgan believes introducing music to young students is key to attracting more people of color to classical music. He knows firsthand. By the time he reached third grade, knowing he wanted to be a conductor, Morgan started taking piano lessons. His parents nurtured his interest. "My father was very active in the schools when my sister and I were in public schools in Washington D.C.," Morgan says. "Both of my parents were seeing to it that those schools were as good as those schools could be, including getting a lot of music education through the schools. And if you go to a lot of symphony orchestras, I think most of the people in them started in a public school somewhere." However, at many public schools today, budget cuts have reduced or eliminated music programs. But it remains a high priority for Morgan. Under his leadership, the Oakland East Bay Symphony allocates one-third of its budget to music education and brings orchestral music to thousands of children in local schools. When he's not conducting, Morgan devotes much of his spare time visiting schools and talking to students. "I love dealing with middle school, high school, and even elementary school musicians whenever I can," he says. "It's just something I have always liked to do. I find it so rewarding to watch the kids learn, watch their faces when they get something right. I just consider it part of my job and do it whenever I can." Morgan is also working to attract diverse audiences to Oakland's concerts. To that end, he has expanded the orchestra’s repertoire and collaborated with musicians outside the classical realm, including from the world of jazz, rock, Afro-Cuban and even electronica. "My idea has always been to play the unusual music next to the standard repertory that orchestras play all the time, not just because of the contrasts and the comparisons you can make between the new and the old, the familiar and the unfamiliar, but also because the audiences for the different kinds of musics will be brought together into the same room to watch concerts. So it's very conscious community building." Filipino jazz pianist Victor Noriega recently made his Oakland symphony debut, after Morgan commissioned him to compose his first symphonic work for the orchestra. It's part of Morgan's effort to connect with diverse communities. He has programmed concerts featuring musicians and original works from Iran, China, Armenia and the Philippines. "It's very important to me that we use the Oakland East Bay Symphony to pull this diverse fractious community together, because to me, that's a major public good that a symphony orchestra can do beyond Beethoven, Brahms, and the other people we play all the time." Morgan's efforts at inclusion and community building are starting to make a difference. Audiences for the Oakland East Bay Symphony are now more ethnically diverse than those in many other cities. Next season, Morgan is planning programs highlighting musicians from India and the Middle East.